Freescale Semiconductor introduced two new broadband RF power amplifiers - the new Airfast AFIC901N LDMOS RF integrated device and the AFT05MS003N LDMOS transistor. The products can be operated at 3.6 or 7.5 V and are targeted for applications where power for radio range and efficiency for battery life are key design requirements. Mobile radio systems, for instance, are transitioning from analog to digital modulation schemes, which usually requires a radio redesign. The outstanding efficiency of Freescale’s newest RF power devices allows land mobile radio OEMs to take advantage of the new transistors’ performance to enhance battery life. In addition, the new devices’ high gain provides an opportunity to reduce the number of transistors used, thus minimizing system cost. Radio designers can also leverage available reference circuits to minimize time to market for their own products. Freescale’s new Airfast AFIC901N LDMOS RF integrated device and AFT05MS003N LDMOS transistor are designed to meet these challenges, with broad bandwidths that cover frequency bands between 136 and 941 MHz. They also offer high efficiency and gain, and are housed in compact and lightweight over-molded plastic packages. Their extreme ruggedness (> 65:1 VSWR) enables highly robust handheld radios. The transistors are well-suited for use in combination with Freescale microcontrollers for applications such as automatic meter readers that operate at 169, 434 or 868 MHz, where they can cost-effectively increase the application’s communication range. They are also ideal for other machine-to-machine applications and supervisory control and data acquisition (SCADA) systems. The AFIC901N two-stage LDMOS device delivers 1 W CW of RF output power with 63 percent efficiency and 30 dB gain at VHF frequencies between 136 and 174 MHz. The device is housed in a QFN 4 × 4 package. As it delivers its full 30 dBm rated power with an input power of only 0 dBm, it eliminates the need for pre-amplification. The AFIC901N offers RF matching flexibility externally to the device at the input and output, as well as at the interstage level. This lets designers optimize the device for their particular system requirements, including multiple radio bands, by changing only a few discrete components on the circuit board. The single-stage AFT05MS003N provides 3 W of CW power. It covers 136 to 941 MHz with 17 dB gain and 67 percent efficiency in the VHF band, and has exceptional input and output. The AFT05MS003N is housed in a SOT-89 over-molded plastic package. 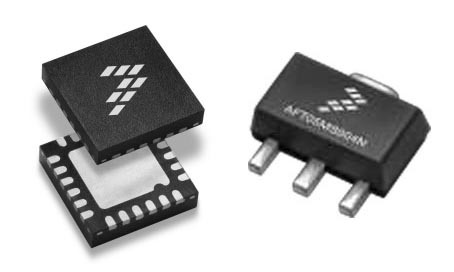 The new transistors join Freescale’s Airfast portfolio of 7.5 to 12.5 VDC transistors for mobile and M2M radio applications ranging from 1 to 75 watts. The AFT05MS003N is in production now and the AFIC901N is currently sampling. Samples and reference designs for VHF (135 to 175 MHz) and UHF (350 to 520 MHz) applications are available for both parts.